I was listening to a podcast this morning about simple living. Both women began discussing how they found minimalism in their lives. As I listened, it occurred to me that maybe not everyone actually knows what their life goals are. In fact, I’m sure not everyone knows. So what can you do to start getting clear about what you want from your life? How can you start getting purposeful about your goals. What does it take to plan them out so they actually happen? Based on my own experience as well as some research, I have gotten together a basic plan for how to figure out your life goals and start planning for them. If you need some guidance, you can find it here. People often wander through life hoping that their purpose will stumble upon them. While this is totally possible, people usually stumble upon their purpose while they were in the middle of pursuing something else. What I’m saying is, you’ve got to get moving if you ever want to get anywhere. Standing still and hoping your dream life will come to you is unrealistic. Goals help push us in the right direction. They help motivate us when we forget why we do what we do. Goals give our lives purpose, direction, and meaning. If you hope to have a life that feels rich and fulfilled, then you have got to have some serious life goals. These goals don’t have to be wealth or fame; goals can be as simple as happiness and love. The path to finding happiness is not exactly something I can guide you to in a single blog post, but I can help you get some ideas on where to start! Make a list – This is your basic starter plan right here. That is if you know what your life goals are. Get out a piece of paper and make a long list. Write out all the things you want to achieve. If your list ends up being really long, Warren Buffet has some advice on how to narrow it down a bit. Write your own eulogy – Brook McAlary was diagnosed with cancer and she said the moment she had to write her own eulogy was the moment she realized why she wanted to simplify her life. Taking a moment to think about your death and what you want people to say about you when you’re gone can really help bring perspective to your current life goals. Flip through magazines– If you’re not great with words, just start flipping through magazines until you find photos that speak to you. Whatever you see that brings you joy, cut it out. –Make sure you get a wide variety of magazines too because you probably have a wide variety of life goals. Draw a picture – I don’t care if it’s stick figures. Taking a moment to draw out exactly what you want from your life can really help you put it in perspective. You may not even know what’s there until you’ve finally gotten it down on paper. What did you play when you were little? – When you were younger, what did you play? What did you spend your free time doing? Thinking back on the past can be the best way to get an idea of what to do for your future? Don’t look for one thing – People often believe there is only one path to happiness. That’s just not true. Don’t just seek purpose in your job or in your home life. Branch out and look around. Graph it out – I know this one sounds the super out there, but it might actually be the easiest one to help you find your life goals and your purpose. It is a Japanese technique called ikigai and it looks a little something like this. Ikigai – Ikigai is basically the Japanese way of saying, “life goals” or “life purpose.” To fully understand the chart and how it works, read my post all about it. Think about things in our world that are successful. People, businesses, buildings… One thing that they all have in common is well laid out plans. Planning your life should be your absolute top priority, even before you start planning out your daily schedule. Why? Because your daily schedule should reflect your life’s plans. So simple. One great way to keep track of your life and schedule is to get a good planner that organizes everything for you. Planning your life goals is the beginning of acting on your life goals. Just make sure you don’t get too caught up in the planning that the actions never happen. Write it down – I used to write goals on my bathroom mirror so that I could see them every single day. There are crazy psychological benefits to writing things down so feel free to write it down as often as you’d like. Say it out loud – The one thing people often tend to do is hide behind their life goals. They are embarrassed or nervous so they never breathe a word of their plans to anyone. It’s time to push that comfort zone of yours and start telling everyone about the goals that you’re working toward. This will make your goals seem real and you just might find yourself with a big support team there to back you up. Get strategic – Start thinking of anything and everything that you can that will help you reach your goal. My biggest piece of advice to start planning your life goals is to start big and work your way back. Think about your big life goal. Now slowly work your way back until you have a few tiny steps that you can take right now toward helping that goal be completed. 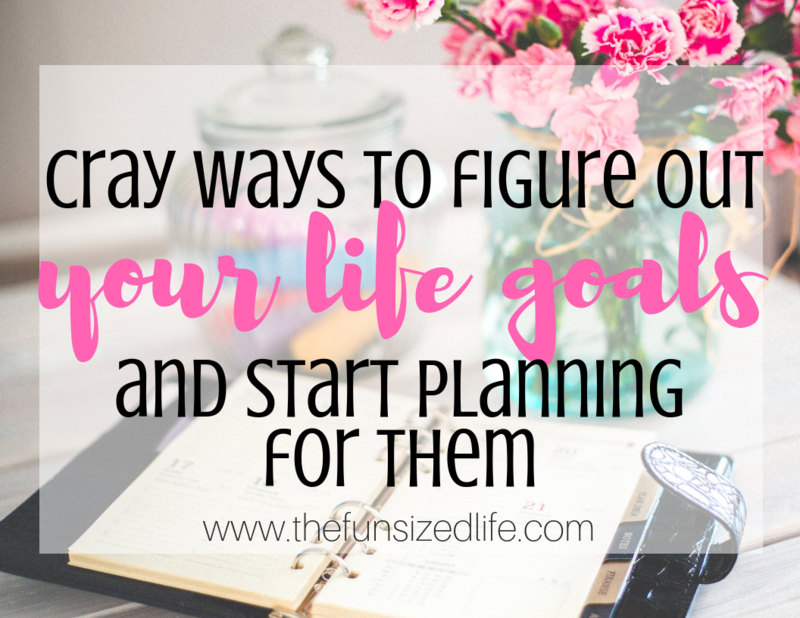 To get extra help, take advantage of this Life Goal Planning Printout to get you started or check out Abby Lawson’s Simplify + Planner. Here comes the minimalist in me! If there is anything in your life that doesn’t align with your goals, it’s time to put them aside. Minimalism means so much more than just decluttering stuff, it can mean focusing intentionally on the life you want to create. Don’t waste any more time letting mental, physical or emotional clutter stand in the way of you and your dreams.